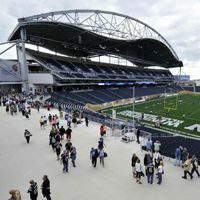 BBB director Andrew Konowalchuk said via e-mail that "The lien will not have any impact on the operation of Investors Group Field." "We continue to have ongoing discussions with Stuart Olson Dominion to resolve project close out and final payments," Konowalchuk said. In November, Stuart Olson Dominion Construction issued a letter to subcontractors, notifying them that the company had suspended work on the $204-million stadium's concession stands and the club lounge until it got paid. That was quickly retracted, and Stuart Olson Dominion vice-president Rick Graumann told the Sun that the company was in negotiations with BBB Stadium Inc.